"The secret buried under the earth might go undiscovered but the secret inside one's mind will always remain for people to unearth it." That's the intriguing tagline that accompanies Vijay TV's band-new Tamil serial, Yamirukka Bayamaen. Branded a mytho-thriller, the serial stars Vadivukarasi, Master Chanakya, Sasi Anand, Anil and Mahalakshmi. Music is by Srihari Krishna. 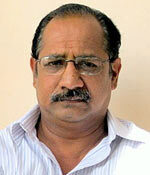 Writer Indra Soundarrajan has come up with the screenplay whose main plot is developed by directors Naga and Ramji. The fact that Indra Soundarrajan has written the screenplay can only mean good things for the serial. After all, he is the same man who gave us serials like Marmadesam and Vidhatha Karuppu. His novels too such as Rudhra Veenai and Kottaipurathu Veedu deal with subjects ranging from spirituality, reincarnation to lost legends. They are usually supplemented by true stories, which have held the readers' attention for years. How did you come up with Yamirukka Bayamaen? Legend has it that Siddhar Bhogar created the idol of Lord Muruga at Palani with Navabhashanam -- nine kinds of poisonous substances. There are stories that he created another idol as well. After all, if I had, say, a block of gold, I wouldn't create just one piece of jewellery, would I? It seems reasonable to suppose that Bhogar did create another idol. There is a Kurinji Aandavar Temple in Poonthottam, in the Kodaikkanal area, which is also of Navabhashanam, but this has been created in a different way. And two families are desperately searching for it, not just for the idol's value but because it's closely intertwined with their future. How would you classify Yamirukka Bayamaen? Is it a spiritual serial? Will Lord Muruga appear later on? Or is it more like a treasure-hunt? This serial has everything. It's a thriller; yes, but it's more a journey of self-discovery where the characters learn something new about themselves and the world around them. I would also call it a sort of treasure-hunt. It's like a mystery. Bhogar too, must have left some evidence about another buried idol. This serial is like searching for the route to a city that doesn't exist on the map. Except that it does. As for whether Lord Muruga appears, our perception of the physical appearance of God has changed in the last 100-150 years. Two centuries ago, people only knew their Gods in the forms they were represented in temples. Now, with the growths of the media, we have these lords and deities liberally showered in gold. They look more like advertisements for gold ornaments than deities. We see God in a certain way, but the truth is he could assume any form; be anywhere. The fantasy-thriller genre in Tamil literature is an exciting one. How did you become a part of it? When I started writing, around 1978-80, this genre was empty [laughs]. I wanted to take up a genre and make it my own. Its not just thrillers that I write. I have written feminist and psychological works as well. Krishnadasi is an example. Right now, I'm working on Ranga Nathi. When did you start writing for TV? My entry into TV was in 1997. I'd been writing steadily in the 80s, and my works appeared in magazines like Anandha Vikatan. I had just finished my novel Marmadesam in 1996, when the call came for it to be made into a serial. The date was February 8, 1996. When the serial was telecast, viewer reaction was intense. Did you have any idea about the cult-status the serial would achieve? Absolutely not. The truth is when these serials were telecast, and the public were in a frenzy, it somehow never hit me. You need to absorb the reactions, to fully understand and appreciate it. I did not consider them as momentous. After all, many writers had attempted and succeeded before me, in this genre. Who's the Indra, in your name? My mother. When I began writing, it was the fashion to have feminine pseudonyms -- we had Pushpa Thangadurai, Sujatha, et al. I thought it would be better to have my mother's name first like a crown, if you will [laughs]. Soundarrajan sounds so tame. Judging by the huge amount of other-worldly themes in your work, have you had such experiences in your life as well? Those experiences were the reason I began delving in the subject in earnest. My grandmother was very fond of me when I was young. Many years later, one night, when I was in Madurai, my wife woke me up at midnight. Apparently, my grandmother had arrived and was standing at our doorstep. I opened the door, but there was no one. My wife swore that she had seen her. Half an hour later, I received a phone-call: my grandmother had died at 11 pm. These were the kinds of incidents that made me go deeper into the subject. The more I learned about such things, the more I began to understand. Today, you could say I have come full circle. I now know that there is a God. The path of understanding, though, is difficult. Sometimes, you learn a great many things which you don't really understand. But this knowledge is necessary, even if it is just a key to a door that doesn't exist. Someday, you will have the lock to which this knowledge is the key. Catch Yamirukka Bayamaen every Monday to Thursday, at 7:30pm, on Vijay TV.